Aside from being a vegetable ingredients or spices, paprika was rich in vitamin C, it implies even higher than oranges. Paprika also contains many nutrients and can prevent cancer, coronary heart disease (CHD), stroke, diabetes mellitus, and can improve sperm quality. Hearing the word chili, everyone would immediately think of some stinging sensation in the mouth. However, have you ever thought of chili that tastes sweet? You do not need to wonder because these types of chili are all around you. Chili peppers in question is, the sweet spicy. Paprika (Capsicum annuum) is a type of chili that taste sweet and slightly spicy. Paprika comes from the family Solanaceae. The shape is unique, that is big and fat like a persimmon. Chili is often used as a spice in cooking or vegetable material. Different from ordinary chili, pepper seeds are usually not eaten. Sweet pepper plants suitable to grow in various climates and can grow in various parts of the world. Paprika comes from South America and has been developed in Hungary. In Indonesia, paprika well known. Paprika many hydroponic developed in Java, Bali and West Nusa Tenggara. 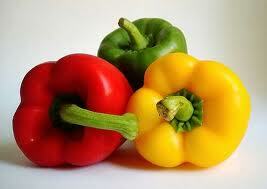 Based on the color, paprika differentiated into green peppers, red peppers, and yellow peppers. Based on taste, paprika, divided into two types, namely the shape of sweet peppers and hot peppers that looks much smaller. Compared with other peppers, paprika including special because it contains a very high nutrition, especially vitamin C. The content of vitamin C in peppers is much higher than orange which is known as a source of vitamin C.
Every 100 grams of red pepper contains 190 mg of vitamin C, the highest among other types of peppers. In contrast, 100 grams of oranges contains only 30-50 mg of vitamin C. Vitamin C is known as a compound the body needs in a variety of important processes, ranging from the manufacture of collagen (fibrous protein that forms connective tissue in bones), fat carrier, the carrier electrons from the various enzymatic reactions, hyper healthy gums, regulating cholesterol levels, as well as immunity boosters . In addition, the body's vitamin C is necessary for wound healing and improve brain function in order to work optimally. The body's vitamin C is 75 mg per day for adult women and 90 mg per day for adult males. The maximum limit consumption of vitamin C is 1,000 mg per day. Paprika is also rich in vitamin A and beta-carotene. In red peppers contain 3131 IU vitamin A, the highest dibandingakan other types of peppers. Vitamin A is needed for the body to prevent eye disease, cell growth, immune system, reproduction, and maintaining healthy skin. Beta-carotene is an antioxidant that may play an important role in reducing the radical concentration peroksil. Ability to work as an antioxidant beta-carotene derived from its ability to stabilize the radical core of carbon. Because beta-carotene effective at low concentrations of oxygen, beta-carotene can complete antioxidant properties of vitamin E are effective at high concentrations of oxygen. Beta-carotene is also known as an element of cancer prevention, especially skin and lung cancer. Beta carotene can reach more parts of the body in a relatively longer time than vitamin A, thereby providing optimal protection against the emergence of cancer. The George Mateljan Foundation (2006) stated that vitamin B6 in paprika including excellent category. This is because peppers contain vitamin B6 with a high density level. Vitamin B6 is important for the brain to function normally, helping to build proteins, hormones, and red blood cells. Most beta-carotene content of paprika is concentrated in the section near the skin. Just like other vegetables, the older the color of paprika, beta-carotene in it more and more.